Let’s take a trip on the magic school bus (where my 90’s kids at?) and learn a bit about water and digestion. No one will argue water is essential; go without it for a few days and you may not live to tell about it. Water is a major player in the role of digestion. Digestion simply put is your body’s ability to break down solids/liquids into smaller molecules and then transport them to their needed stations of the body. Water is an important part of the breaking down and transporting process. Water is a solvent, aka it dissolves things. Water does this constantly in the body by dissolving proteins and nutrients, carries them to the cells and also carries away waste. Concluding water is vital to our digestion and absorption of nutrients. How do you know if you are getting enough water to aid digestion? Well one easy way to take a gander at your waste…your pee and your poo. Is your urine dark yellow/brown? This is no bueno and a sign of dehydration. What does your poo look like? Are you straining a lot or not dropping the kids off at the pool on a daily basis? If so, your constipation may be due to a lack of water. 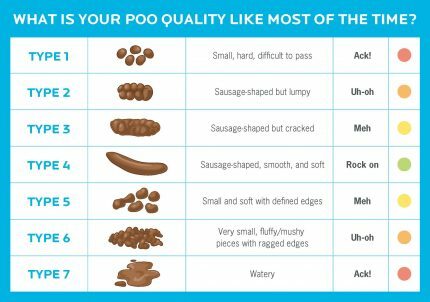 Take a look at the chart below by Precision Nutrition to rate yo’ poo. 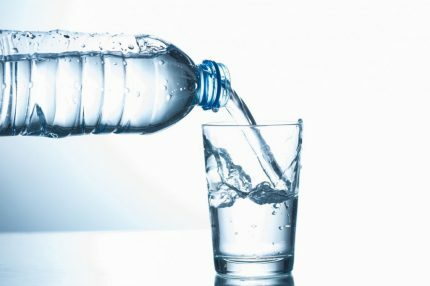 If you are type 1 or 2 and possibly 3 you may benefit from increasing your water intake. If your digestive tract is not getting the water in needs to preform properly then it will look elsewhere for water, this can lead to things like muscle cramps and that parched feeling in your mouth. One final tip: make sure you are getting lots of water during times of indulgence such as birthdays, vacations and the holiday seasons. During this time we are likely to decrease our fiber intake (fruits and veggies) which can also lead to constipation. Combating these, hopefully short term, eating habits by drinking more water will likely help you have a better time in the loo!